The fall Jewish holidays are upon us. I wrote about preparing to celebrate these holidays with the girls when they were two years old, but as they’ve gotten older, how they interact with the symbols of the holiday has changed. They continue to love the shofar blasts on Rosh Hashanah, and this year they were eager to tell us everything they had learned in school about the process of repentance that is associated with Yom Kippur, such as the biblical story of Yonah (Jonah). But this year, their favorite has definitely been the fall harvest holiday Sukkot. On the first Sunday of October, while the girls learned about fire safety at the Coolidge Corner fire station, I went to the Israel Book Shop on Harvard St. to purchase the lulav and etrog we use as part of the ritual of the holiday. While Muffin really enjoyed looking (carefully) at the etrog, Squeaker got a great deal of pleasure of carrying the lulav in its protective case. She loved this so much that she carried it part of the way to and from the synagogue on the holiday itself. After lunch, we went to our synagogue, Congregation Kadimah-Toras Moshe in Brighton, to build miniature sukkot out of candy and other sweet treats and to help the synagogue decorate the sukkah to be used by the community. 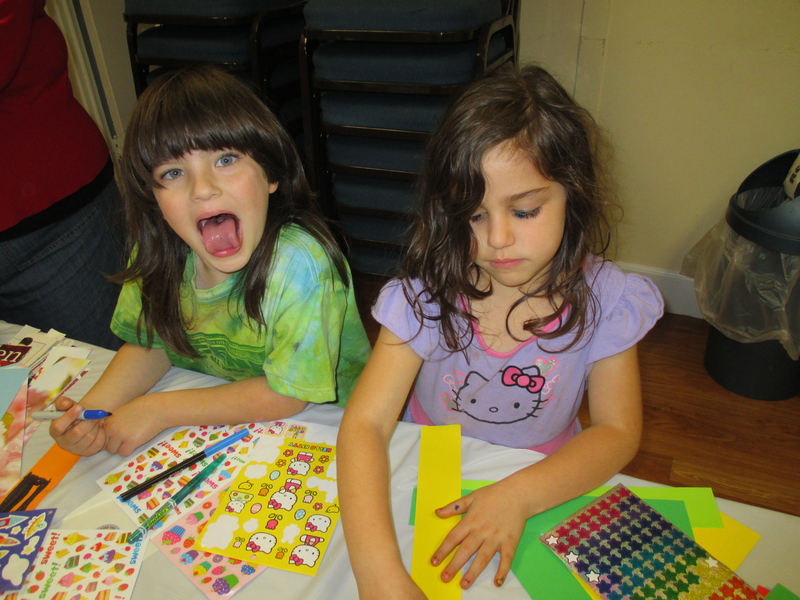 Sunday afternoon, in very nice weather for early October, we went to the synagogue to build paper chains, do arts and crafts, and contribute to the making of large murals that were hung in the sukkah. Muffin, Squeaker, and two of their friends had a great deal of fun creating unique decorations for the sukkah, and when we subsequently used the sukkah when the holiday began, they derived great pleasure from pointing out which creations they had made. The girls have also found other ways to celebrate the holiday. Because many sukkot were constructed in our neighborhood ahead of the beginning of the holiday so that they would be available for use during the holiday, Muffin had a lot of fun spotting neighbors’ sukkot. Some were obvious, as they were built in people’s front yards. However, some were tucked behind houses or placed at the end of driveways, and Muffin really enjoyed seeking those out. On the holiday itself, the girls have been enjoying celebrating the holiday by eating meals in our friends’ sukkot. We have already had meals in the sukkot of parents of young children with whom the girls are friends or with other families that have kids that are the kids’ age. This has allowed Michael and me to fulfill the obligation to eat in the sukkah without the girls feeling left out of the ritual. At the end of the holiday, we will be having a meal in the sukkah of one of the girls’ former teachers, and both Muffin and Squeaker are looking forward to seeing her. On the intermediate Sunday of the holiday, there were many community events set up to celebrate. We attended one, the Sukkot Extravaganza on the Brighton Common, organized by one of the local Jewish day schools. Michael especially wanted us to attend this specific celebration over the others for one reason: the event was advertised as having a bouncy house, and our girls love bouncy houses. Muffin has always been a fan, and Squeaker has, more recently, come to find joy in them. So off to Brighton we went. To the girls’ amazement and great pleasure, they had not just one bouncy house but three different types of bouncy apparatus. When they weren’t playing on the bouncy houses, they ate hot dogs, ran around the common with their friends, watched a magic show, and participated in a raffle. As they get older, the girls are gaining a better appreciation of what the holidays mean for the cycle of their year, and they are becoming more sophisticated in their enjoyment of the holidays. We can’t wait to see what new discoveries they make about the holidays in the year to come. This entry was posted in Columns and tagged Jewish, Judaism, Raising Jewish kids, Sukkot. Bookmark the permalink.